Connor Schell, vice president of ESPN Films, announced at the final panel of the Television Critics Association summer press tour that the acclaimed, Peabody-Award-winning 30 For 30 sports documentary series will return with a second “volume” on Tues., Oct. 2. The network had originally announced that the series would be retired after the first set of 30 documentaries, but the level of acclaim it received, as well as the popularity of the more watched episodes, prompted the network to resurrect the brand. The films announced include “Broke,” a look at athletes who’ve gone bankrupt after retirement from director Billy Corben, who directed the first volume's "The U"; “Benji,” Coodie Simmons and Chike Ozah’s consideration of promising Chicago high school basketball player who died young; and “You Don’t Know Bo,” Michael Bonfiglio’s profile of multi-sport athlete Bo Jackson. Other topics that will be covered in the upcoming episodes include the auction of the rules of basketball, Jimmy Valvano, Ben Johnson’s steroids scandal, and the 1962 Ole Miss football team and the struggle for civil rights. “Broke” will be the first film to air, and five films will air in October, with a sixth airing Dec. 8. (The Valvano doc, as of yet, appears to be unscheduled.) All episodes will be available on iTunes the day after air, and ESPN will announce more films in the near future. 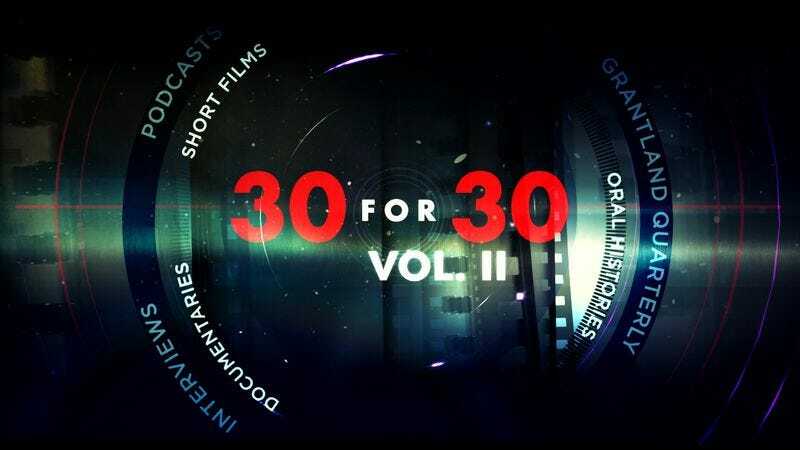 The network will also produce a series of documentary shorts called 30 For 30 Shorts, which will premiére online at ESPN’s site Grantland. The first film will be about Arnold Schwarzenegger’s early attempts to boost his profile via bodybuilding while he was in the Austrian army. It will debut in September. And that’s the last time you have to hear the words “Television Critics Association summer press tour” until next year. You’re welcome.